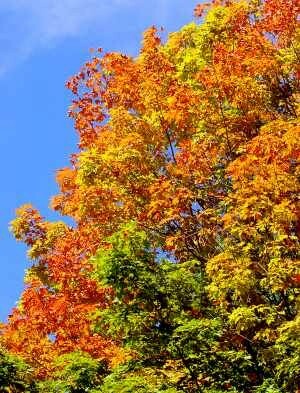 « Starting to Plan for New England Fall Foliage? Will Maine Fall Foliage Be Early This Year? We’ve had a bit of a debate around the house lately about when this year’s fall foliage in Maine is likely to be at its best. We’ll give you the points of view, and you can cast your vote, and we’ll see how well we do at predicting when the colors will change. Most years the best time to see fall foliage along Maine’s Midcoast region, and down into Freeport and Greater Portland is from about the beginning of October (possibly the end of September) through almost the end of October, with the peak time being the second and third weeks in October. Ruth’s view is that the trees will behave like the other plants have this year, and they’ll be ahead of schedule, so she says you can expect colors to begin changing in September, and the peak will be in early October this year. As “proof” Ruth points out that some of the trees in the area (mostly along the highway) have already begun to show signs of changing, and it is only August. Scott disagrees (some would say that is not surprising). 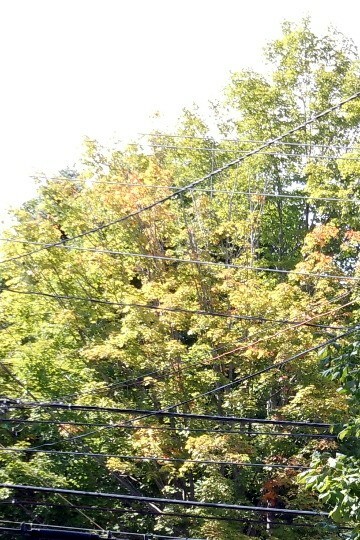 He says that the amount of rain we had early in the summer will mitigate the effects of the early spring, and we’ll have a normal foliage season, with the peak in mid-October, or possibly even later. As proof, he looks at our neighbor’s tree across the street, which is always the first tree in the neighborhood to begin the fall foliage color change. 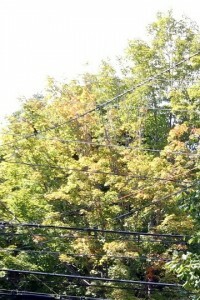 In most years that tree has turned vibrant colors by August (photo at top). This year it has barely a hint of color (second photo). You decide! Let us know when you think peak foliage in Freeport will be this year in the comments. Then come visit it at Brewster House in Freeport!